As I was sitting here, replacing missing rhinestones on my daughter’s dance jacket, I remembered something I wanted to share. I made some huge mistakes my first couple years rhinestoning. I have occasionally made the same mistake, but am getting better. What is this mistake you ask? Using too much glue!! You can tell which rhinestones are the old ones, because they are cloudy and flatter. The more conical shaped ones are the new stones that I’m replacing old ones with. Not only is using too much glue a problem, but so is letting it ooze out the sides of the stone, and not scraping off the extra! About a year and a half ago, I wrote a blog post on comparing E-6000 glue and Gem Tac. I was still fairly new to rhinestoning, but had learned a few things along the way. I have been continually amazed at the response that post has gotten. Thank you to those of you who have read and/or commented on it! I feel I need to give a quick update to that post. Grace’s jacket is going on two years old now. The old, apparently “foil back” rhinestones are falling off with almost every washing now. The commenters who said E-6000 ate their rhinestones, I have an idea of what you mean! It took about a year and a half, and LOTS of washings (I think Grace would wear it every day if I let her), but they are, one by one, clouding up and falling off. I have been replacing them as they come off with the Flat Back Swarovski stones that I can get through our dance studio. Those have not had any issues so far. I think she was only missing 1-2 rhinestones when she left for Iowa. This is what it looked like when she came back! 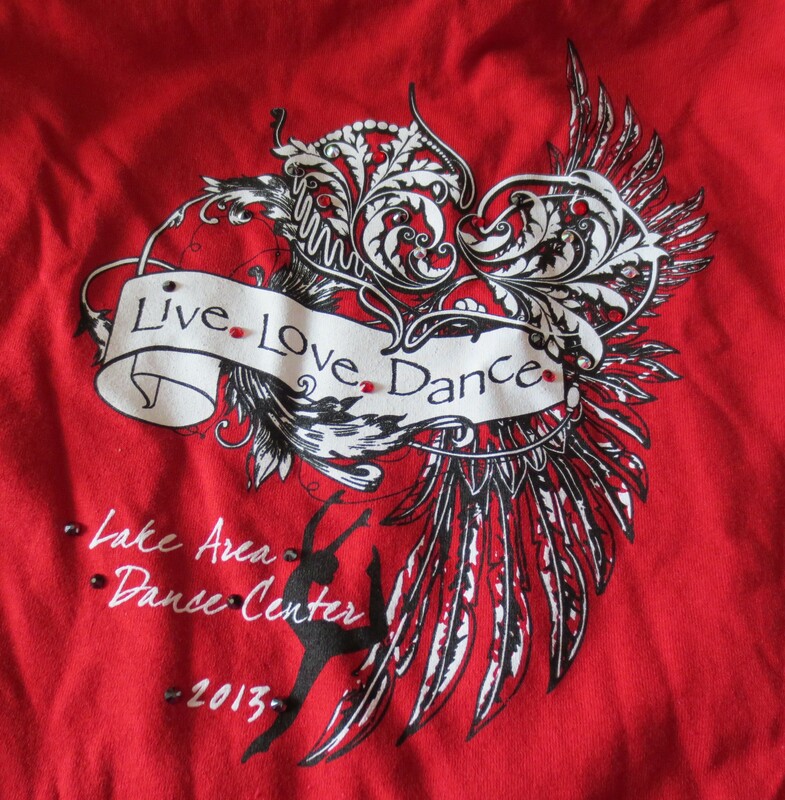 This summer, Grace went to her first dance intensive at the Iowa Ballet Academy. It was a long, grueling week, with about 7 hour days of dancing. While it was probably the most intense week of her life, she loved it, and wants to go back. Learn from my mistakes, PLEASE! 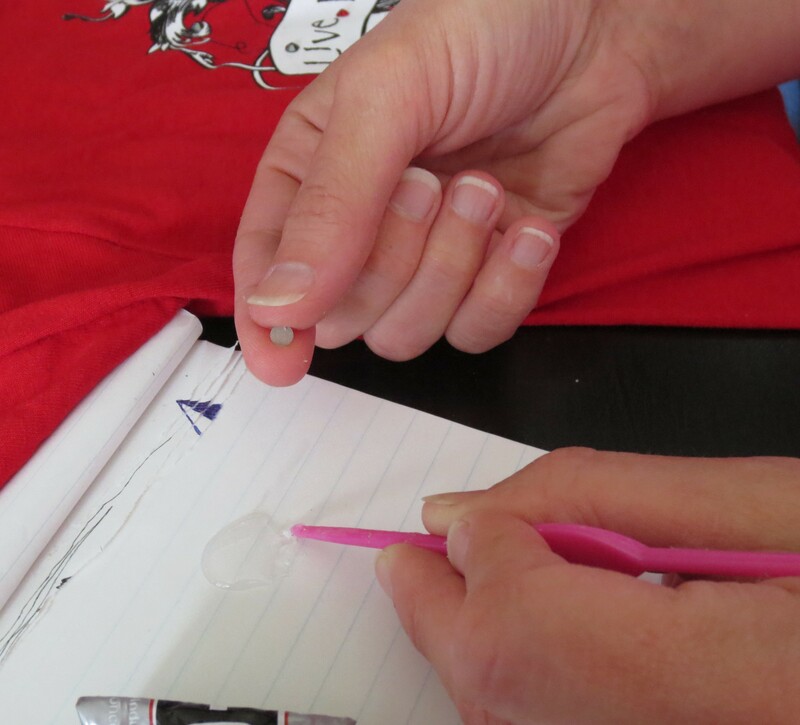 Mistake #1 – using cheap rhinestones. I didn’t know any better. Now I do! Mistake #2 – using too much glue. It’s a fine line between not quite enough, and too much. There’s also an amount of time that is too long to let the glue dry before using it. I end up throwing away globs of glue because I started with too much, and it dried to quickly. Letting it get a little tacky is a good thing, letting it get rubbery is not. A little practice, and you will figure out just where those fine lines exist. 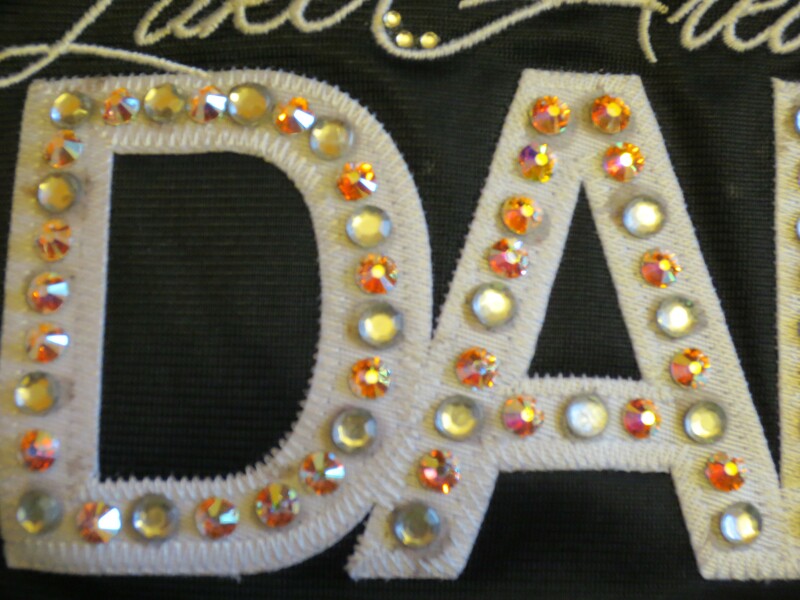 Mistake #3 – leaving the glue that oozed out the side of the rhinestone alone. While both Gem Tac and E-6000 will dry clear, they are still glue. When they get wet (for example, in the wash), the glue that is exposed will become a bit tacky again. This will trap all sorts of dirt and other particles that are coming off your other clothes, and floating around in the wash machine. After a while, each little circle of glue around each rhinestone starts to look pretty gross! If you have rhinestones that are falling off, like Grace does, it isn’t pretty! In the second picture above, you can see the dark circles around areas where rhinestones used to be. YUCK! A simple cure for Mistake #3, take the second wax stick in your pack, and use the edge to scrape off the extra glue that may have oozed out the sides. You will also want to make sure you don’t push down on the rhinestones too hard, and all the glue oozes out. I have done that too. I have later had to go back and reglue those, since they were then barely stuck on. 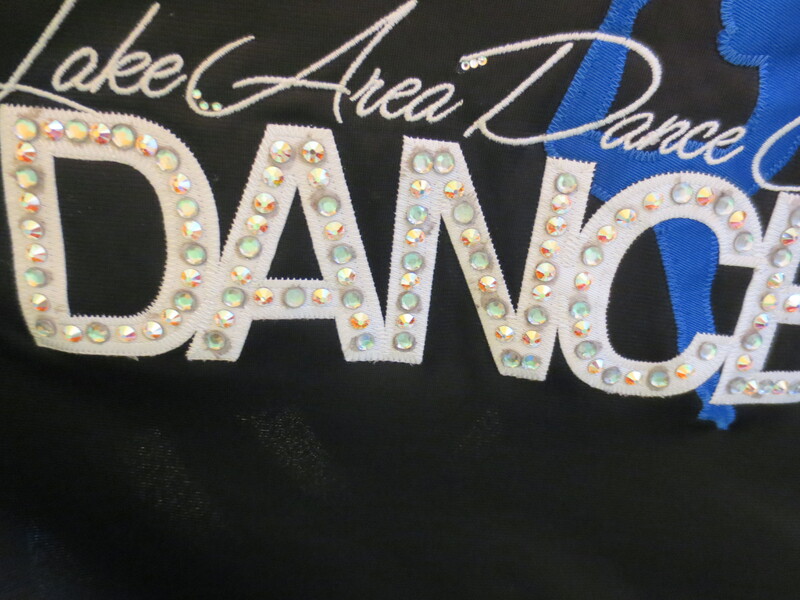 On dark or shinier fabrics (like those on our dance jackets), the glue sometimes dries with an almost whitish appearance. It may also look whitish even when scraping off the excess glue. I have not yet figured out the best way to get this off. Just be careful not to get too much on in the first place! If you have a trick to remove the glue residue sometimes left behind, I’d love to hear about it. Please comment below! 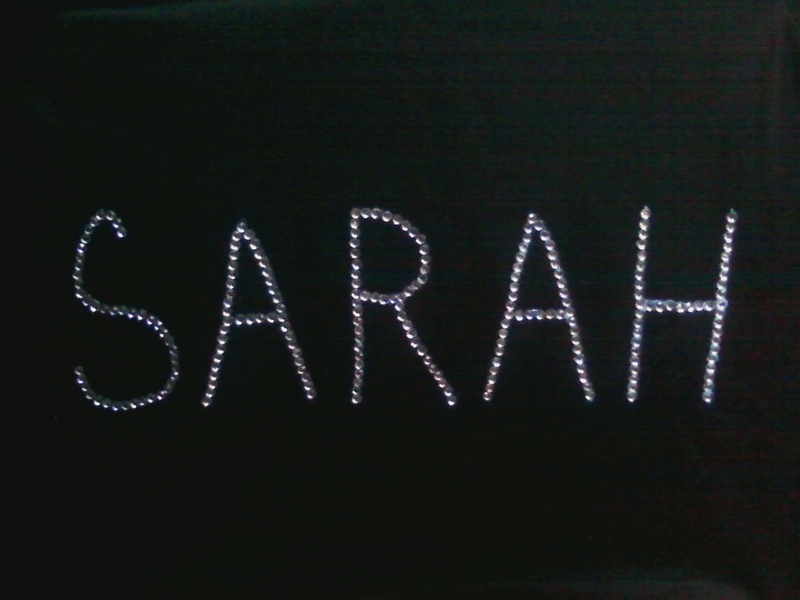 One of the fun parts of being a Dancem0m, is rhinestoning costumes. I used to be afraid of it, but I really enjoy it, especially now that I know what I’m doing. Every year, I seem to learn a little bit more about glues, designs/styles, technique, etc. Rhinestoning for this year’s costumes is done, but I thought I’d share a couple things I’ve noticed about technique. When you are applying rhinestones to any type of fabric, the glue is likely going to bleed through a little bit. You will want to do a little prep-work to spare yourself from ruining your work surface, as I did the very first year that rhinestoning anything. My name is still forever printed with dried glue on my folding tray that was my work surface. I have seen different people prep costumes for stoning in different ways. Some people cut a piece of cardboard and slide it inside their costume. I have heard this technique is also a good one to use when you are working with a stretchy fabric. You need to be aware of the type of fabric you are working with, or you will end up with a look that you don’t want when it dries. If you are stoning a design, such as a star, you want to make sure the material is stretched when you apply the design. If you don’t, it might end up bunched up or pulling around the glue; or the design might end up stretched out, ruining the look you are going for. Some people put a layer of wax paper or parchment paper between the fabric layers (or between the fabric and working surface). This works well for fabrics such as t-shirts, jackets, etc. I have also just taken paper that I was going to recycle (such as junk mail, or a flyer from school) and put it in between the layers. 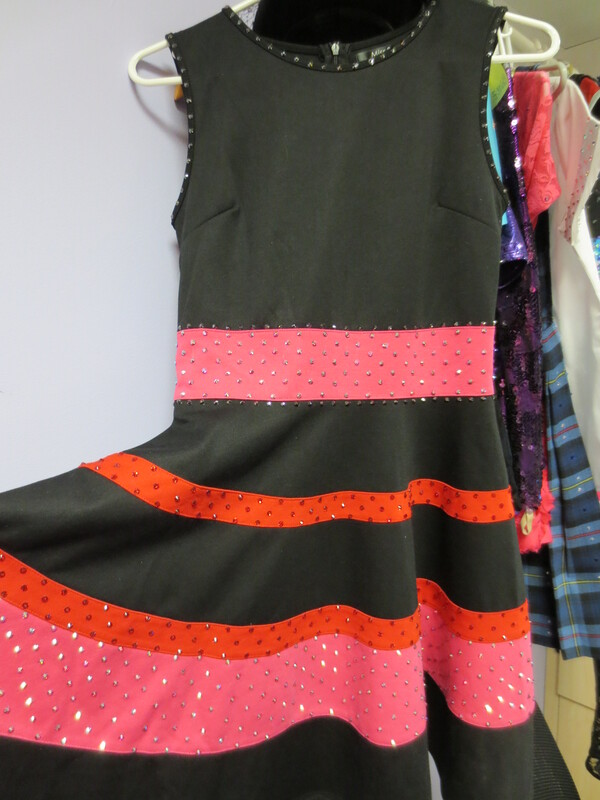 Last year, we had to randomly put 200 or so rhinestones all over a tulle skirt for my daughter’s tap costume. 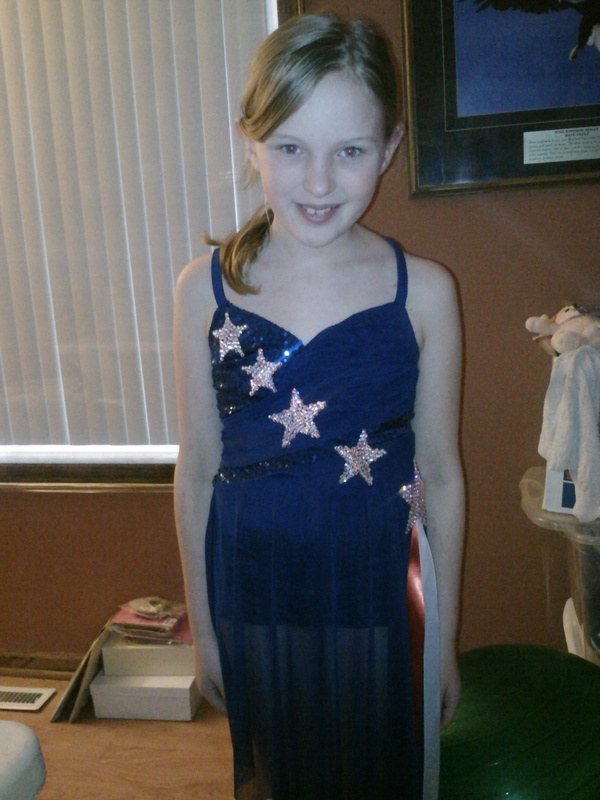 I kept the dress hanging on the hanger, and just put my hand between the layers as I stuck the rhinestones on. E-6000 dries fast enough, and the layers were loose enough, that I didn’t have any issues with the tulle sticking to anything else. I also used the “hand as a backing” technique for doing around the neckline of my daughter’s lyrical costume, and for the body of her tap costume. Using your hand allows you to gently stretch the material to avoid the bunching or pulling I talked about earlier. I have not had issues with bleed through, but have hung it to dry, or placed wax paper in between while the costumes dried. 1. The way I usually apply rhinestones, is to put a dime-sized glob of E-6000 on a piece of cardboard, wax paper, or scratch paper (a small stack might be best, in case it bleeds through a bit). I then use the end of my wax stick (the side without wax), dip it in the glue, twirl or wipe off the stringy end, and cover the back of the rhinestone with it. 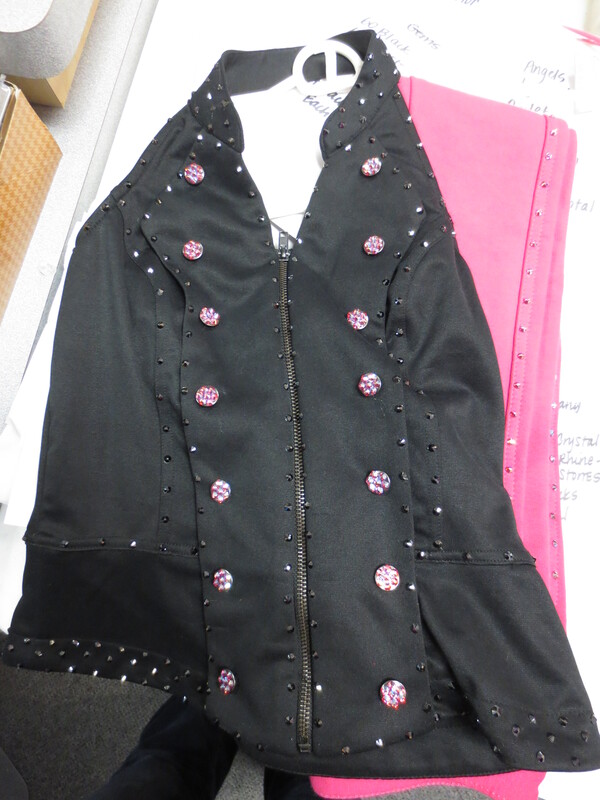 I then use my fingers to place the rhinestone on the fabric. I press down gently on the rhinestone to make sure it is completely affixed to the fabric. I use the end of the 2nd wax stick from the package to scrape off any glue that has seeped out from under the rhinestone. Some people use the wax side of the 2nd wax stick to hold the stone, and eliminate some of the mess. In my experience, a rhinestone with glue on it, at the end of a wax stick, tends to fall off more easily. Though, I have seen other people do it successfully. I don’t mind the mess on my fingers, they wash. I mostly just use the wax side to pick up a rhinestone from a pile of them. 2. 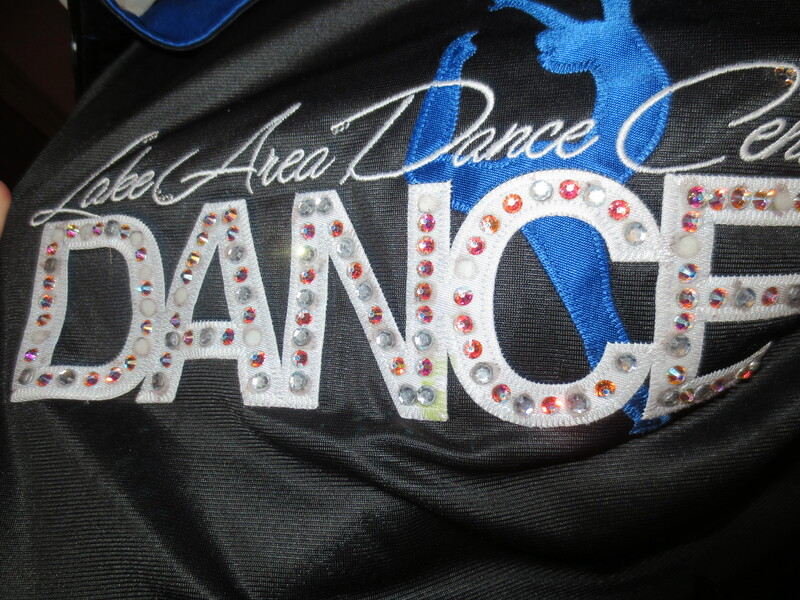 Another dance mom ordered some really tiny rhinestones online. 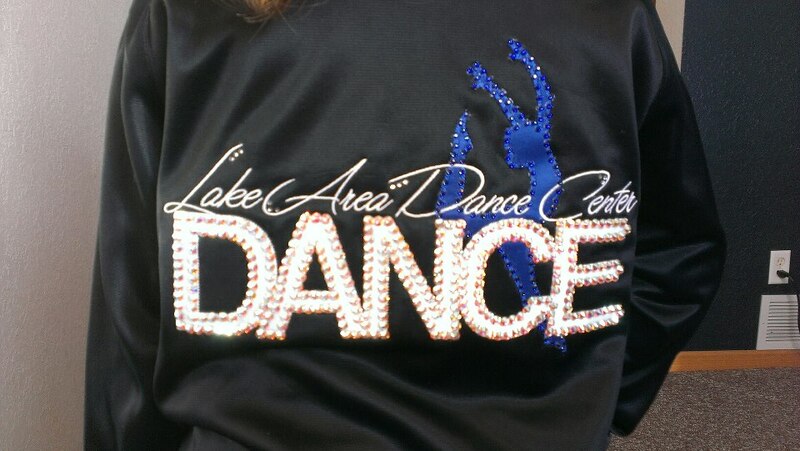 She added some really cool effects around the letters of our studio’s name on her daughter’s jacket. 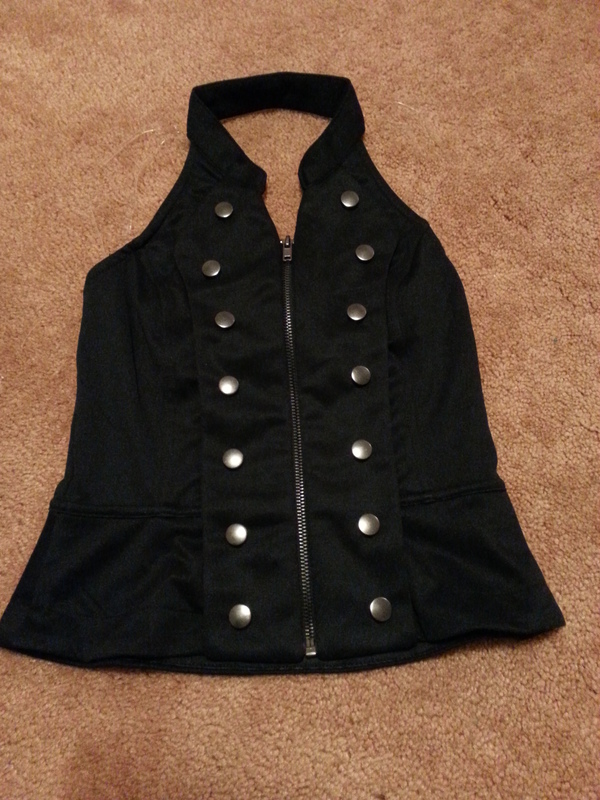 I tried to recreate it with the regular rhinestones I had, but it didn’t look the same. She shared some of her extra stones with me so I could do the same thing on my daughter’s jacket. The stones were so small, that my regular technique didn’t work. I started out with the same technique of putting E-6000 on the end of a wax stick, then made a thin line on her jacket where the stones would go. I used the wax side of the stick to place the tiny rhinestones on the glue. When the stones were all set in place, I used the end of the stick that didn’t have glue on it to scrape the extra glue off. You will want to make sure you use a very small amount of the adhesive when using this technique, or you will end up with a huge mess! 3. 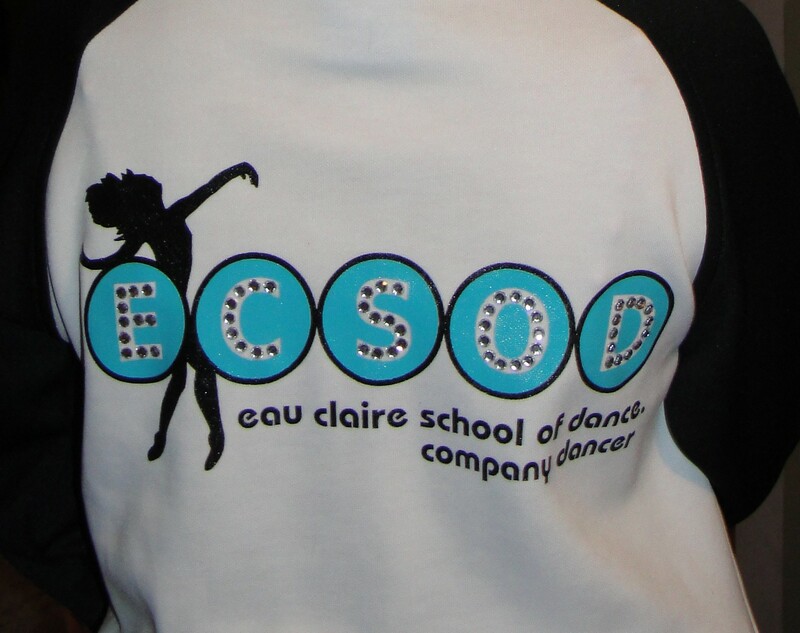 The last technique that I have seen some moms/dancers do, but have not had much luck with myself, is to squeeze the E-6000 directly on the garment from the tube. Then take the wax stick and place the rhinestone on the glue. One dance mom said she feels as though this is the least messy, and easiest way for her. When I’ve tried, the glue keeps coming out, or I end up with way too much glue on the spot I want the rhinestone to go. I guess it’s all in the control you have over the tube. I obviously don’t have that mastered yet. The people I have watched do this make it look simple and flawless. Drying: To dry the costume, shirt, or jacket you are rhinestoning, you can hang it, drape it over something (like the back of the couch, if it’s safe), lay it out on a table, etc. How you let it dry doesn’t matter so much as long as you let it dry before it’s worn. If it’s not completely dried, the stones are not completely adhered to the fabric, and your risk for having rhinestones pop off goes up quite a bit. Most people recommend giving the garment at least 24-48 hours to dry before wearing. The same is true for washing it. Make sure it has had plenty of time to dry before washing, or all your hard work will literally be washed away.